Mc Donald's called him today to come in for an interview. Dave had to take him since I had a client at 4pm...I told Dave that if Jeff got a job we would have to work out the drop off/pick up schedule because I couldn't lose ALL my afternoon clients to come from the other side of town to pick up Jeff and take him to work, but I would be willing to SHARE the responsibility. They hired him! And they wanted him to start IMMEDIATELY! So....Dave left him there, and called me. He needs to be picked up at 11pm. That means my son will have worked from 4:30pm until 11pm!! That is 6 1/2 hours of gainful employment where I didn't have to wonder where he was, worry who he was with or what he was doing. He will come home exhausted and I am sure he won't be sneaking out of his window in the middle of the night! I came home from work to find the IRONING BOARD set up in the middle of the room..which means he IRONED his clothes before his interview! Hahahahahahahahhahha....I've been waiting for this day for a long time! It's almost 8pm now...let's see...that still gives me three hours to do what I want until it is time to pick him up...oh happy day! On the other hand....Jason and Shanon have split up. Jason is moving back home.....more on that as it unfolds. Quipped by Bonnie K. Hunter at 7:58 PM 22 Snips & Comments by others! I'm still thinking on the borders for "My Blue Heaven" I have these left over hour glass units. What if I were to make more of them and use them as the second border? I tried to put them right up against the quilt center and they got lost. I don't feel like making more flying geese units, they will just add to the busy-ness, but I thought that the hourglass blocks, all being blue...would darken the edge but still have some spark to them...more than a plain slapped on border, you know? And....I can use up more blule 2.5" strips this way? what do you think? Quipped by Bonnie K. Hunter at 2:40 PM 26 Snips & Comments by others! I've got the top center together! 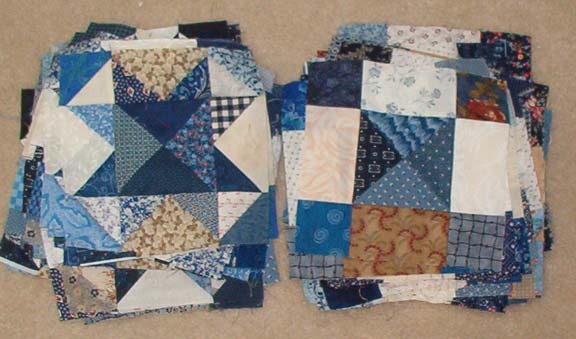 Yesterday I sewed the blocks into rows, this morning I sewed the rows together. I like it! The close up shot shows you the weird variety of fabrics I used in this quilt. Really, when I pull fabrics, I just go for color/light/dark...there are 20 years of fabrics in this quilt including such weird things as a western fabric with cowboy boots, ropes and hats...and a cutesy farm animal print with cows and chickents and pigs. It is just what was IN the scrap bin. I use it. I don't care how old it is, how outdated it is, how ugly it is...I just use it. This quilt has batiks, hand dyes, 1988 paw prints and pin dots, novelty prints, shirtings, white on whites, cream on creams, plaids, ginghams, stripes, lots of 1990 calicoes, music prints....EVERYTHING. 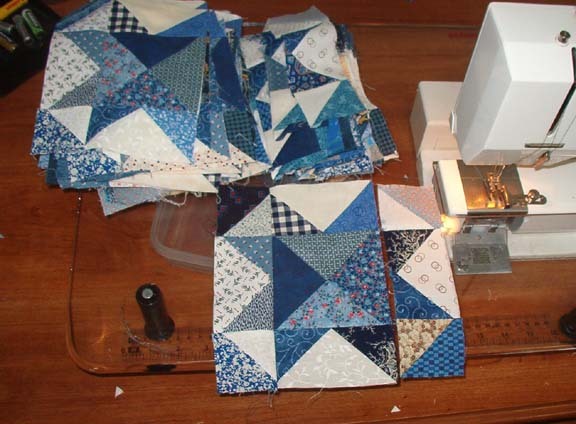 If you are new to making scrap quilts, please dare yourself to use everything! 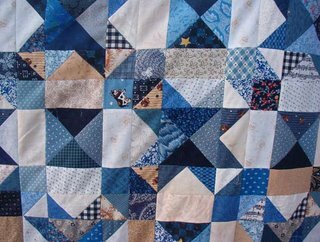 I see a lot of quilts out there where fabrics are separated so much by "kind" (all 30's repros, or all civil war repros, all batiks, all tone on tone or whatever) that there is no punch or whimsy to them. I feel that my scrap quilts refect who I am because they have EVERYTHING from my whole quilting life in them. When sewn up, even fabrics that seem to not go together, GO TOGETHER! I now have to contemplate borders..do I take the easy way out and just slap a couple on there, or do I do something fun? I'll have to think on it a bit. This is as much time as I can spend on it today as I am working on a customer's feathered star quilt that needs to be done ASAP and there are several others in queue pressing to be done too. Taking a week off put me a week behind, but it was a break I desparately needed. The weather is gorgeous and glorious here....makes me want to be out in it! Quipped by Bonnie K. Hunter at 9:50 AM 12 Snips & Comments by others! 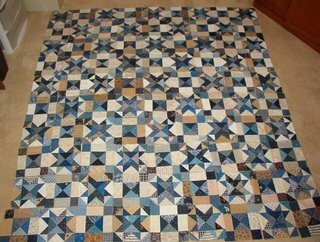 I finaly decided to sit down yesterday and push towards the completion of this quilt top! You may remember several posts earlier I was going gung ho on this, but then life got in the way. Yesterday afternoon I was off work early and decided it was time to sit and POWER SEW! I had 180 1/2 square triangle squares to piece...did those in one long chain...and then started adding those to the remaining flying geese units that had been done earlier. Added these units to the sides of the star units I already had constructed, and voila! 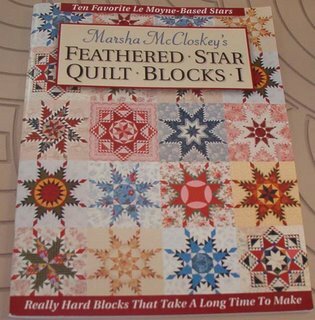 45 hour glass star blocks and 45 hour glass puss in the corner blocks! They are now laid out on the floor ready to be assembled into the top. 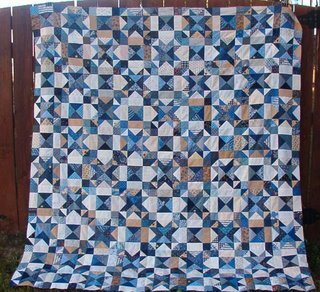 Remember those piles of blue and neutral strips I pulled out to make this quilt? (See way below, oscar the cat is inspecting them) I am amazed to say that this used maybe...1/2 the strips?There is still A LOT left! I'm not sure what I'm doing for borders yet, so maybe they will be used there, but once again it reiterates to me just HOW MUCH fabric I have and how far scraps will/can go in a quilt...farther than you think! Easy Angle. The flying geese tris and the 1/2 sq tris are all cut from the same 2.5" strip. When you cut the pieces one corner is notched so they fit together PERFECTLY. I'm a big fan of these rulers....they've been around forever and I don't think they've ever got the attention they deserve. Quipped by Bonnie K. Hunter at 7:47 AM 29 Snips & Comments by others! I did have a wonderful trip. PERFECT weather for driving. It was sunny, leaves just turning on the way up. On the way back they were even MORE beautiful, though not quite at peak, that is okay for me. I arrived in Bethesda on tuesday afternoon, about 1/2 hour after my dad arrived, so he got all the checking in done at the hotel :c) How is that for good timing? I really enjoyed Bethesda. It is lively, busy, and very diversified! There are more restaurants than anyone could ever explore in a week's time...but suffice it to say that we ate out at a different 'nationality' every night! FUN! We met up with Tonya on wednesday morning and we all toodled in to the smithsonian area of DC. If you aren't familiar with the Metro, and without a guide...I think it is easy to get turned around, you might have the right train, but going the wrong way! And then have to figure out how to get to the other side of the platform, do you go under? Or up and over? And having to put MORE money on your little ticket (exit fare) so you can actually get OUT of the Metro? Oh yes...it was fun for all, but by the time we were done, we had it down pat! Thursday we spent all day at the Holocaust museum. My dad is a big history buff, and he had to read every little display, watch every film, after lunch, Tonya went on home (I don't blame her! *LOL*) and I toodled with Dad while he explored everything. It really does make an impact. Especially with what is going on in the world today. That was a completely insane episode in history, and hopefully thanks to things like the holocaust museum, it won't happen again. Friday we took a bus tour from 10am til after 4pm and saw ALL the monuments. It was a beautiful day to be out, a bit chilly, but a light jacket and all was well. There was no better way to get all these in. And since Dad is moving slower, being on a bus was GREAT for him. Saturday morning Dad left to continue is motorcyle trip around ther perimiter of the US....and I headed over to Tonyas to play with fabrics...and kitties! I brought some show and tell, we played with that..discussed how we were going to quilt one of her quilts, and then we headed out for lunch, and then to do some quilt shop hopping! I actually BOUGHT fabric. But it was stuff I needed, including a 2 yrd piece of a fabulous black with colored squiggles on it. 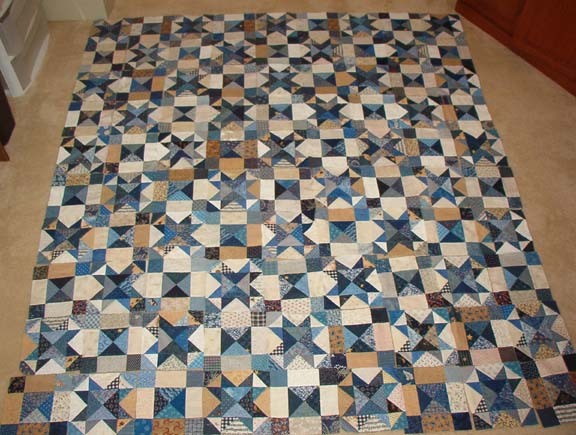 I see this as a border....it is perfect to pull a bunch of odd stuff together and make it fit. So I indulged. I also bought the feathered star book by marsha mccloskey that I've been wanting. Sunday morning I left Tonya's in Bethesda about 9:30 am and made it home by 5pm so I made good time. I am wanting sewing time, but yesterday I had to jump right back to work at the clinic. This afternoon/evening my Dad will be coming through here and staying the night at my house after a few days ride down the blue ridge parkway in VA and NC....so...no sewing time! Quipped by Bonnie K. Hunter at 10:27 AM 16 Snips & Comments by others! I've even had emails from several of you asking if I needed help coming up for air! 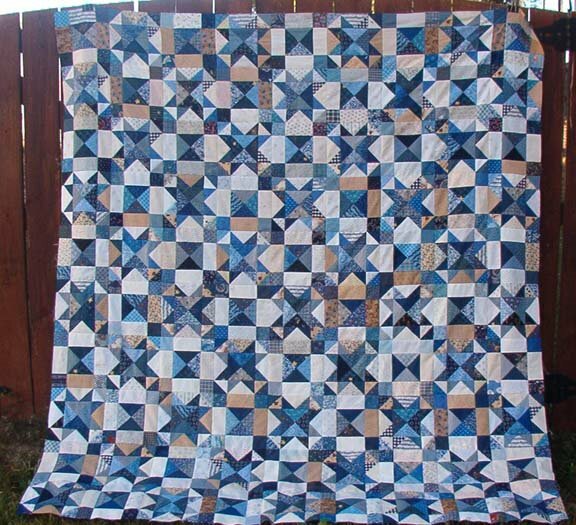 And just a few weeks ago I was on such a roll with my blue quilt, but life got in the way. You know, I have 1/2 sq triangles all cut and ready to feed through the machine, but I haven't been able to even SIT at the machine unless it was for finishing someone else's binding. I've been quilting, but it is on other people's quilts, not on my own. Deadlines abound, and they seem to be taking up all my time. I spent a couple hours this morning culling through my charity quilt stash. I'm resigning from being the charity quilt chairperson at the end of this year, there is a new gal stepping up to take my place, and along with the guild stuff I need to pass on to her, I thought it would be a good time to go through what I really didn't love anymore and see if it would broaden the charity quilt stash for the guild a bit better. The guild stuff is AWFUL UGLY. While I was chairperson I tried to make kits with it to use up what had been donated, and it is just not EASY to make all this stuff go together. So...I've added to it stuff I am happy to say farewell to in hopes that it spices up the mix a bit and the new person can find ways to use all this stuff. Because I cleaned out...I now have a whole pile of my own stuff..and when I mean pile, I mean pile! 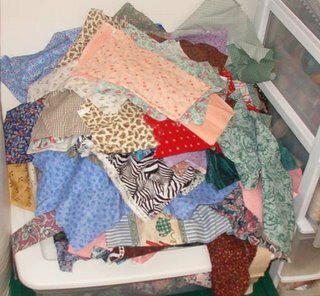 This pile includes pieces that are FQ size, some larger, some a bit smaller...small stuff I had tossed over to the charity quilt side of things, and now I'm pulling them back. I'm going to strip them down and feed them into my scraps. I need to find a way to make these chunks useable so that I will USE THEM. I know it doesn't look like a very attractive mix of fabrics..but I am always amazed that when making scrap quilts, if you mix it all in....somehow it just seems to work for me. When will I get around to cutting this up? I'm not sure! I've got a customer quilt on the machine I need to finish this morning, I need to go to the massage clinic this afternoon, tomorrow I have the "walk for life" breast cancer walk downtown, and I have to drive to Aiken to deliver several quilts to the quilt shop there! I was supposed to take them to guild meeting monday night, but instead...I'm going to DC!! 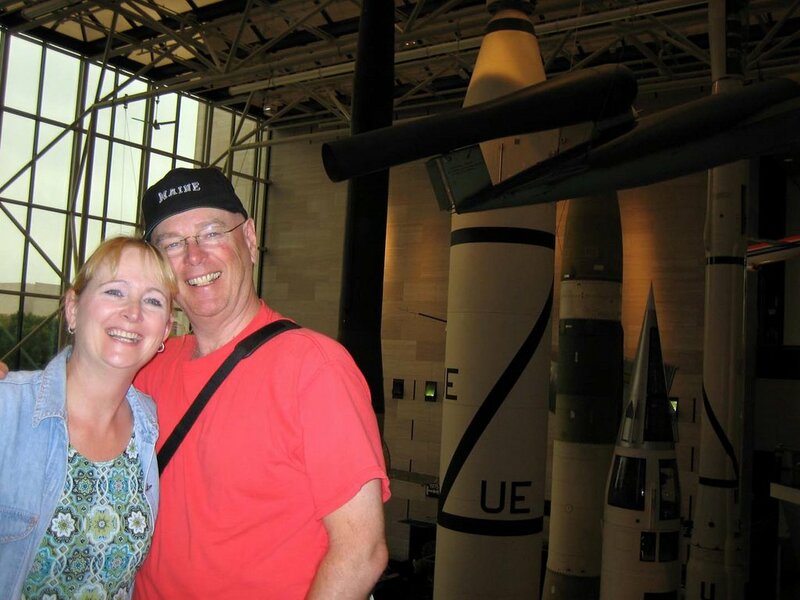 I'm meeting up with my Dad and spending several days with him doing the tourist thing in DC. I'm also planning on meeting up with TONYA! YAY! So...looks like Bonnie won't get in any sewing next week either! Quipped by Bonnie K. Hunter at 9:07 AM 19 Snips & Comments by others!